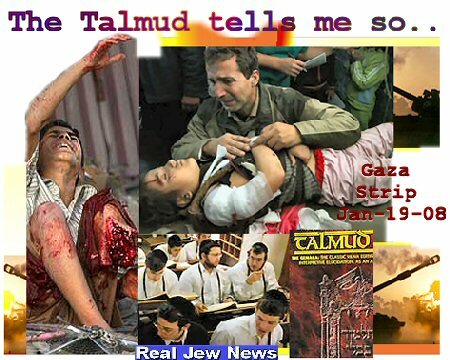 THE JEWISH TALMUD IS A WICKED BOOK. The Talmud teaches Jews to look down on Gentiles as inferior to them. Don’t believe the Jews when they tell you that Judaism does not teach contempt for the Gentiles. They’re lying. The Jews say they honor “righteous Gentiles.” But “righteous Gentiles” for the Jews are not pious Christians. “Righteous Gentiles” for the Jews are those who promote Jews and their agendas - like George W Bush and Hilary Clinton. “Goyim:” This is what the Jews derisively call Gentiles to indicate an “animal nature” of the Gentiles. “Schwartza:” This is what the Jews derisively call blacks to indicate an “ape like nature” of the blacks. “Shiksa:” This is what the Jews derisively call a Gentile woman to indicate a “carnal nature” of a Gentile woman. ~ This Yiddish word “shiksa” is derivative of the Hebrew word “shegitz” which refers to the carcass of a pig. From whence comes this Jewish disdain for the Gentiles? It comes from the Talmud, a wicked book, which the Jews consider more authoritative than the Bible. THE TALMUD TEACHES: “When it comes to a Gentile in peace times, one may harm him indirectly, for instance, by removing a ladder after he had fallen into a crevice.” (Shulkan Arukh, Yoreh De ‘ah, 158). During the “Yom Kippur War,” when Jewish soldiers were still unclear of how to deal with Arab civilians, an exchange of letters between an Israeli soldier, “Moshe,” and a rabbi, “Rabbi Shimon Weiser,” ensued. These letters were published in the Yearbook of one of Israel’s most prestigious religious colleges, Midrashiyyat No’am, where many leaders of Israel’s National Religious Party have been educated. Soon the letters, under the title The Purity Of Weapons, became the standard policy of how Jews should treat Arab civilians when waging war. — “Dear Rabbi. In one of our group’s discussions there was a debate about the ‘purity of weapons.’ [From Talmud]. We discussed whether it is permitted to kill unarmed men or even women and children. — “Dear Moshe. According to our sages, war for us is not a game but a vital necessity and only by this standard must we decide how to wage it. On the one hand we seem to learn that if a Jew murders a Gentile he is regarded as a murderer though no court has the right to punish him. But we find in the very same authorities saying: ‘The best of Gentiles - kill him; the best of snakes - dash out its brains.’ According to Tosafot, though during peace time it is forbidden to kill Gentiles, in a case that occurs in wartime, it is a mitzvah [religious duty] to kill them. HOW CAN WE STOP THE CIVILIAN-KILLING JEWS? Option #1. Do not vote for candidates who pander to the Jews. Option #2. Do not allow the Jewish Media to form your opinions on Israel. Option #3. Realize that the system is so totally corrupt, run by Jews, and that only by educating our neighbors is there hope for the system to change. As for me and my house, I am at the point where I am totally relying on the Lord Jesus Christ to get out His whip and drive the Jewish moneychangers out of every political sphere of influence which they now occupy! jEWs say that THEY are the Master Race !!! Time to WAKE the world up !!! Then BOYCOTT those buggers !!! I’m not Jewish and I agree with a lot of what is said here. I just want to share my mothers experience with Jews. First of all my mother loves Jews, you can’t talk bad about them in front of her. My mother was a piano teacher for many years, most of her students were Jewish, why this was, I don’t really know. Just want to note that my mother is Catholic. Despite being extremely different and unique like a lot of musicians, her students loved her. She was always receiving cards and gifts from the Jewish students or their parents. They were always praising, what a great teacher she is. many of the students were very young a stayed with my mom for years. Recently two of her students (brother and sister) graduated from a well known college with masters degrees in music. Their parents had a big graduation party for them on their joyous occasion. My mother was invited and being the kids teacher, trainer and mentor of music for years, she was like the queen of the party, being constantly praised for the great job she had done with the kids. To this day she receives cards and letters and family fotos from Jewish kids(now grown up)and parents, that she hasn’t seen in twenty and thirty years. All the while she taught them she would always receive gifts and cards from them on my mothers Christian holidays! And to this day they never forget her. Dear Jerry - are you as naive as you sound? Of course they praise your mother, she helped them on the road to earthly success! First of all, I said I agree with a lot of what is said on this site, minus the hate, you won’t convert anyone with hate. Didn’t Jesus say…But I say unto you, Love your enemies, bless those who curse you, do good to those who hate you, and pray for those who insult you and persecute you. Or was I hallucinating when I read that? Most Christians are paranoid hipocrites, they say act like Jesus but at the same time believe if you act like Jesus, Christianity will be overtaken. No, I said she was catholic, didn’t I? In case you didn’t know, Catholics rarely evangelize. Whats the matter with a little earthly success? Is it a sin to be successful? You can’t be successful AND be saved, is that it? They’re musicians for pete’s sake, not criminal freemasonic world bankers. A sociopath is a sociopath. All religions have books that council every sort of evil, which depend upon force and fraud. Those books are for the sociopaths to read and use on others. Jews can be suckered like anyone else. Some of my most faithful friends have been Jews. One Jew was even what I would call a Jew-hater or at least he abandoned his identity as a Jew. Sociopaths are everywhere and they hide behind flags, crosses, and stars. Sometimes we need simple example’s of what the good brother wrote in the above article. I have three example’s. Firstly is my deceased Uncle Mel. He was in his seventies and fell on a slick snowfilled sidewalk. They rushed him to Barnes Jewish Hospital. Within a few days he was deceased. My cousin blames his death on the Hospital itself. She says he was not properly attended to. When he was having problems she said that it was hard to even locate someone to tend to him. 2. Recently my brother-in-law Bill who is in his eighties went to the doctor. He had internal bleeding in his head. He was sent to Barnes Jewish Hospital. The next day they wanted to hook him up to a machine. His wife refused. She had him sent to another hospital. Within a month he was back home. He’s even driving his car. If he would have stayed at Barne’s I’d would have attended his funeral. Instead he’s alive and driving everyone crazy. 3. My best friend’s mother was taken to Barne’s Jewish Hospital. They gave her the wrong medicine and she died. My cousin and my best friend both blame Barnes Jewish for their loved one’s deaths. My brother-in-law is 86 years old. He was a pre-Vatican 2 Catholic. He was from Philly. He use to get up early and serve at the Altar for the Philly Bishop. He dropped out of the Church when all the changes took place. I told him he didn’t drop out of the Church, but rather was preserving his Faith. Ever since I met Bill he has hated the Jews. Real Catholics always hated the Jews. Phoney Vatican two Catholics love the Jews. The Power and the Influence of the Jews comes to the forefront in the information about Barnes Jewish Hospital. For Gentiles it’s one of the worst Hospitals in the world. Because you have a high percentage to die in it if you are a Non-Jew! Read about Barne’s being one of the best in the world. Jewish Murderer’s!!!!!!!!!!!! Barnes-Jewish Hospital is located in St. Louis, Missouri. It is consistently rated one of the top hospitals in the United States by U.S. News & World Report. In 2007, it was ranked 9th-best medical center overall. Barnes-Jewish Hospital is a member of BJC HealthCare. Barnes-Jewish is the largest hospital in Missouri and is the largest private employer in the St. Louis metropolitan area. As of 2006, it employs 9,373 people, 1,707 of which are physicians. It is responsible for the education of 921 interns, residents, and fellows. Barnes-Jewish has 1,228 beds, 53,907 inpatient admissions a year, and has 77,847 emergency department visits in 2006. Nearly 17000 surgeries were performed at Barnes in 2006. The hospital is the adult teaching hospital for Washington University School of Medicine. Dear Jerry, your reply to the good Brother appeared as if you were sort of angry with him. He is your friend in Christ Jesus. You wrote : No, I said she was catholic, didn’t I? My comment: If they don’t evangelize then they are not Catholic. All of us was instructed to preach the Gospel. And the main part of the Gospel is to instruct people on how to be saved. If your not a member of the Apostolic Catholic Church you can’t be saved. I personally believe in ” No Salvation Outside of the Catholic Church.” If you believe that anyone can be saved without Christ and His Church than why even have missionaries. The pre-Vatican Two Church sent missionaries to every part of the world. This was for one purpose. To instruct them about Christ and the necessity to join His Church. The stories of the Jesuit missionaries are legendary. Read the life of this one missionary. Saint Isaac Jogues (January 10, 1607 – October 18, 1646) was a Jesuit priest, missionary, and martyr who traveled and worked among the Native Americans in North America. He gave the original European name to Lake George, calling it Lac du Saint Sacrement, Lake of the Holy Sacrament. In 1646, Jogues was martyred by the Mohawks near the present day Auriesville, New York. Jogues, St. Jean de Brébeuf and six other martyred missionaries, all Jesuits or laymen associated with them, were canonized in 1930 as “The North American Martyrs,” or “St. Isaac Jogues and Companions.” Their feast day is October 19, except in Canada, where the feast is celebrated on September 26. He slaved for 30 years and the Indians didn’t allow him to baptize one person. He thought he was a total failure. But later Catholics realized that he was the reason for thousands of Indians to become Catholic. I personally have informed a lot of people that in order to be saved they need to become Roman Catholics. I informed John Stadtmiller, Alex Jones, Don McAlvany, Dr.Ray Jurjevich, Randall Terry, and many others in my life time. Dr. Jurjevich was a person whom I use to talk to every weekend for many years. He was an Orthodox Christian and like a father to me. But this didn’t stop me from informing him that I still believed he had to convert to Roman Catholicism in order to be saved. He was truly the most educated man on the Jewish conspiracy. He was a great man! Don McAlvany’s daughter had a tumour the size of a grapefruit growing on her. I told him that I would get contemplative Sister’s to pray for a miracle. A miracle took place and the tumour disappeared. He was very greatful. I only met Randall Terry once in the 1980’s during one of the operation rescue’s. I with love informed him that he couldn’t be saved as a Protestant. Recently I found out that he converted and became a Roman Catholic. Maybe I had something to do with it. The pre-Vatican Two Church prayed for the conversion of the Jews. The Vatican Two Church doesn’t pray for them, but accepts them as they are. Your mother was probably influenced by this Heretical thinking. It would be much better to do as the good Brother suggested to you below. I thought Alex Jones was a Catholic…the fact that he’s one of the few people that talk about the New World Order and doesn’t sling mud at the Jesuits or the Vatican (and he called the anti-Catholic crowd “the worst”) gave me the impression that he might be. Either way, I think that anybody who has been validly baptized (as a member of the Catholic or Orthodox Church) and still practices their faith will be saved. However, I’m not sure if baptisms in the various Protestant denominations would be considered valid, since they don’t have apostolic succession, and their theology is very divergent from what the Catholic and Orthodox Churchs teach. In any case, this is a great eye-opening article. 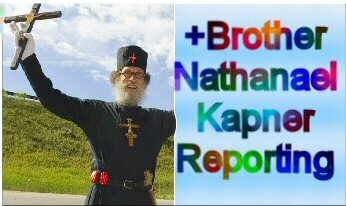 God bless you, Brother Nathaniel, for standing up to the Jewish elite and spreading the truth about them! Very few people I know have that kind of courage. Well I know now why they slaughtered 80 women & children in Qana Massacre and 412 kids in Gaza! I don’t mean any disrespect, but direct your prayers only to GOD because only GOD can hear and help us. As in the case of Jerry’s mother, I see that we Muslims should also respect those who do good to us no matter if Christian or Jew. A responsible attorney needs to direct the readers here how to make complaints to the local police regarding these general murder and theft threat teachings that are taught within the Talmud. Some of these Talmud teachings I believe are very serious felony violations in many US states, and in particular these threats are felonious when these harm and injury threats are made against the very young and the older senior citizens in the USA. I believe that anyone may walk into any police station in the USA and file a police report against these general USA population Talmud harm and injury threats. To Irish American: Alex Jones is a disinfo agent married to a Jewess. P.S. Don’t even trust messianic Jews if they still adhere to their Jewish roots. I met one and he still wore his kippa, was arrogant and trying to proselytize me into his way of thinking. And everyone should know about the Dabru Emet. This is a committee of 170 rabbis who convinced some protestant churches to ignore certain passages of Scripture in the NT that blames them for Jesus’s death and anything else and to accept that they are still the “chosen” people and the old covenant still stands. That is the greatest of the deceptions…not Vatican 2. Do the Jews not understand that they have to have outside sources to teach them anything? That most are unable to educate themselves without a teacher? This, in my view, just paints a picture of pure jealousy because, they themselves are unable to make themselves superior without assistance. Notice that their hate is more directed at white people, first and foremost, simply because, the white demographic tends to be able to create from dust and no education. Not saying the white is superior, all colors have potential for greatness, but, power over another to feel that power of god is the devil in the flesh. They are unable to accept and be comfortable around anything or anyone that does not benefit them. Once they have killed off the best, who’s going to save them from doom? They are impious, and are guilty of iniquity. They are powerful hypocrites who have been given the keys to the kingdom. I have friends who are Jewish. I have addressed this problem about the Talmud with them and in the Jewish Journal comments sections. My friends won’t discuss it, but readers of The Jewish Journal state that the Talmud is so esoteric, I could not possibly understand it. Is that why it has been removed from the law school reference stacks and locked up? My father was a victim of Shlomo Recshnitz’s skilled nursing home in Costa Mesa. He started out doing very well, but when my brother and I got bronchitis, then pneumonia and could not visit him, they stopped feeding and hydrating my dad. This was done twice, and he was 911′d out to Hoag, Hospital which had previously been a Presbyterian nonprofit hospital. When my dad got there it had gone to for-profit status. A Jewish doctor who had been a resident at the university where I had worked 34 years kept trying to get us to not start feeding dad, and let him die. I fired him. However, this went on constantly. One of the other docs said he needed a temporary trach to keep his airway from eroding. We were told it would be in for 3 days, then removed. He was transferred to another horrid facility called Kindred where the Talmudic death assault continued. His trach was never removed, even though his lung function is better than mine, and I am an athlete. It is now permanent, due to their diabolical intentions. A week stay ended up lasting for 1.5 years. The CEO (a Zionist Jew) sent us to check out a stepdown facility. The CEO was also Jewish and demanded to know if we were members of “The Tribe”. Of course another attempt was made on my dad’s life and we couldn’t transfer him anyway. I finally came to the realization that Christians are going to be knocked off after taking all their assets. It is being enacted against my poor dad daily. We nearly have to live in the hospitals to protect him. That is why Jews have their own hospitals. I never wanted to think that humans could be so cruel. This has come to pass right in our faces since 2008. Now we find out that every elected official, every banker, every doctor, every media mogul all are Jewish or have sworn loyalty to these devils. It really is happening. Anyone who wants to argue has not had enough experience…but THEY WILL. Really!